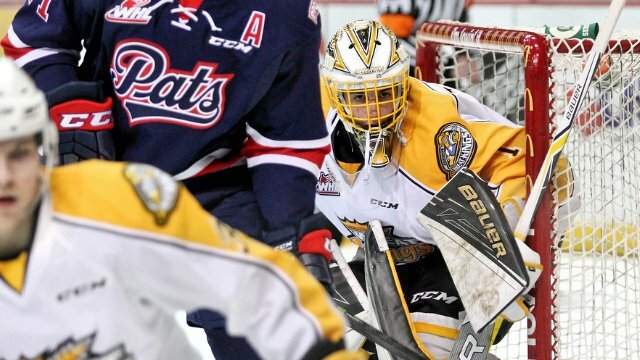 BRANDON – The Regina Pats dropped their first shootout game of the year on Wednesday night, 2-1 to the Wheat Kings in Brandon. The Pats opened the scoring on the powerplay thanks to Nick Henry in the first period. Ty Lewis tied the game for Brandon later in the frame. The goaltenders took over from there and the game went to a shootout after 60 minutes, tied 1-1. Tyler Coulter scored the lone goal on penalty shots and the Wheat Kings took the extra point. Sam Steel, Nick Henry and Adam Brooks were all stymied for the Pats. Tyler Brown earned second star honours, making 34 saves in the loss. Logan Thompson of the Wheat Kings was the first star with 39 saves in the Brandon goal. Regina outshot Brandon 40-35 while going 1/7 on the powerplay and 4/4 killing penalties. The loss dropped the Pats' record to 23-3-6-1 on the season. - The Pats penalty kill has scored twice and not allowed a goal in their last 17 shorthanded situations. - Adam Brooks has tied teammate Sam Steel for the WHL scoring lead with 59 points. - Tyler Brown made 34 saves in his 13th straight start in the Pats goal. The return to action Friday night when they visit the Prince Albert Raiders. Puck drop from the Art Hauser Centre is at 7 p.m. on 620 CKRM. Next home game is Sunday in a rematch with P.A. at the Brandt Centre at 4 p.m. Tickets are available at reginapats.com or at the Brandt Centre Box Office. - the Pats have lost six of their last ten road games, not what a champion should be doing. - watched the game and the Pats had not direction, fire or leadership. - they have to pick up their road play. Why do some bloggers keep referring to the Pats as champions? The organization, and real Pats fans have never said they are going to win the Memorial Cup this year. Thay are a good Team that are fun to watch. They have a lot of skill and that is why they have only 3 regulation losses. Some (for the most part Anon's) only come on here when they lose and you'd think the Pats are bottom feeders by the way they comment. No team is going to win them all and no player is going to get 2,3,4 or 5 points a game so if "Neither Steel's line nor Brook's line scored even strength" what the hell is the big deal! It was a great defensive game where the tenders stood on there heads to force OT. Not sure what you people want? Agreed, the goaltenders stood on their heads. It was a different kind of game than we are used to, but both teams had a lot of great chances, the goaltenders just shut the door. Also, I can't tell if the daily "Champs" poster is real or a troll, but I'm leaning towards troll. Come on Weppler we have heard it time after time "Canadian Champions", Memorial Cup Champions etc all about the Pats . You should maybe read more and not just what you write because most times you sound just like they do. Can the PATS really walk on water ? The comments about Canadian Champions, Memorial Cup Champions come from anonymous trolls. Mr. Weppler offers a knowledgeable fans perspective. I expect you only want to read insults and hate filled comments about the Pat's. Well Wayne not sure what your reading but I have never said Pats were going to be Champions of any sort. Just that I like the new owners and the way the Pats are playing. Been a season ticket holder for years so been thru the tough times. When you read somebody legit that says Pats are the champions point me to it so I can read it. THx. Ivan Hlinka Tournament Coming to Edmonton?